This is especially important for those of us who are constantly trying to eliminate dark spots and acne scars. Even if you’re blessed with “that good skin,” breakouts are inevitable. We’ve all been privy to the countless culprits that leave us with blemishes–stress, lack of sleep, hormonal changes–and probably dabbled in the quick fixes that promise fast results. Spot treatments are particularly attractive because they’re made with a concentrated ingredient that directly combats a specific issue. And when the packaging promises overnight results, how can you not try it?! Well, we’ve tried them all and while some have worked better than others, trial and error reminds us that how we use a product will have an undeniable impact on the type of results we see. This is especially important for those of us who are constantly trying to eliminate dark spots and acne scars. So, we’re going back to spot treament basics with Julie Clark, founder of Province Apothecary, a cult favorite organic brand that specializes in holistic beauty. For starters, it’s important to identify the stressors that are giving you skin problems in the first place. In addition to the ones we’ve already mentioned, lack of hydration, not washing your pillowcase and the normal vices (alcohol, sugar, smoking) could all be contributing to your winter-to-spring skin woes. This is where a spot treatment comes in handy. Although it should never replace your cleanser, adding one into your routine means you can cut the time it takes to get rid of a blemish in half. They’re suitable for all skin types, but again, be sure that the ingredients won’t interfere with your skin’s natural chemistry. 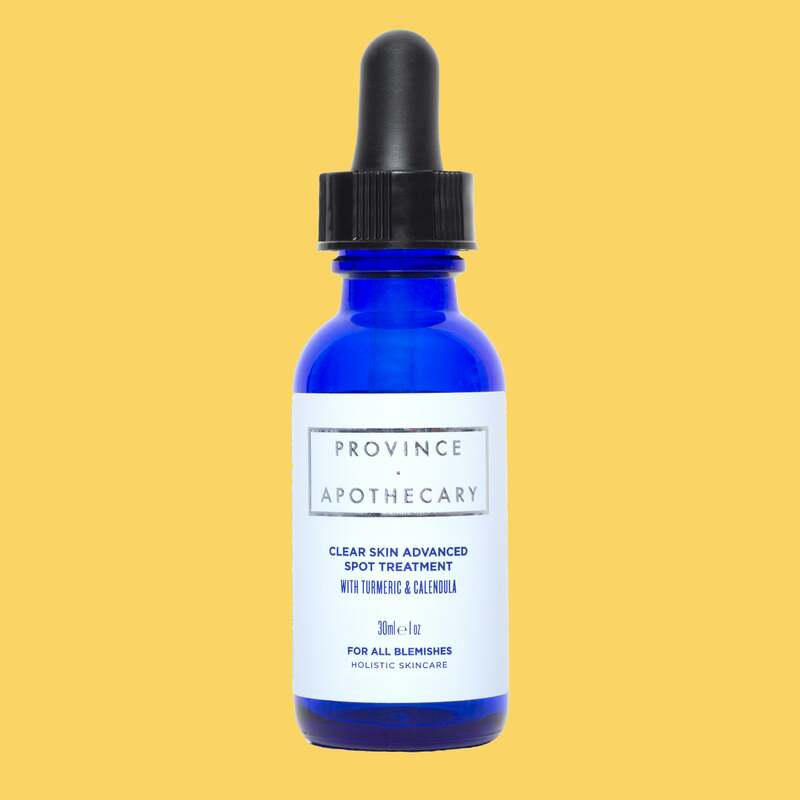 For instance, Province Apothecary’s Clear Skin Advanced Face Serum is great for sensitive skin because it’s made with tumeric and calendula, both of which are best for reducing spots. Once you’ve narrowed your choices down to one, remember that a little goes a long way. For the Clear Skin Advanced Face Serum specifically, shake before using and place just one drop on the blemish. Give it two to five minutes to absorb and repeat 3-4 times a day. At the end of the day, no two blemishes are the same, so choose wisely and remember to solving your skin’s most deep-rooted problems will take time and extra care. Click here to shop the entire Province Apothecary lineup!